It all started for Nigel with the purchase of a Nagra location sound recorder for £100. After a few hires, and the steady purchase of more equipment, Nigel eventually found that the hire business was taking up more time than he could commit to location recording, and so he gave up the day job to focus on equipment hire full time with his wife, Valerie. With Nigel and Valerie’s home quickly running out of capacity, the company was moved to premises in East Sheen. In 1986 Nigel saw an advert for ‘former educational premises’ to let; the location was perfect, and the company made the move to The Old School in Richmond, Surrey which was to be their base for the next 30 years. Looking to work in the film industry, I joined the company in 2010 as a Bookings Coordinator. Very early on, the history of the company and the reputation it held within the industry became clear, and the broad range of equipment stocked set it apart from others. It was unique. It also had a long-standing loyal client base containing some of the leading sound recordists in the UK. In September 2016 Nigel and Valerie sold a majority share of the business. In January 2017 I took on the position of Managing Director. Walking into our current location at Shepperton Studios (where we moved to in 2016), it is a recording engineer’s dream, a veritable Aladdin’s Cave of equipment ranging from classic items such as the rare Beyer M800, the industry standard Neumann U87 through to the modern DPA 4071 lavalier mics employed for the revolutionary recording techniques of Les Miserables. It is this range of equipment that has allowed us to be involved in some truly unique projects. The original Nagra IV-S reel-to-reel units were provided for an episode of the hit BBC Two comedy ‘Inside No. 9’ which recreated a working 1970s drama TV set using period cameras and vintage sound equipment for a truly authentic feel. But perhaps one of the crowning glories of Richmond Film Services is our contribution to the filming of Les Miserables. Director Tom Hooper insisted a condition of his role was that all vocals would be recorded live on set, a novel approach with numerous technical obstacles to be overcome. Richmond Film Services had provided DPA lavalier microphones to the recordist Simon Hayes for a live take with Meryl Streep in Mama Mia some years earlier, and so combined with the latest wireless radio microphone systems and 50 lavalier microphones, the directors vision was realised in a way that actors and audiences alike have credited with a level of emotion that other techniques would struggle to achieve. The results of this hard work were recognised with the 2013 BAFTA for Best Sound and the 2013 Academy Award for Sound Mixing for Simon Hayes and his team. 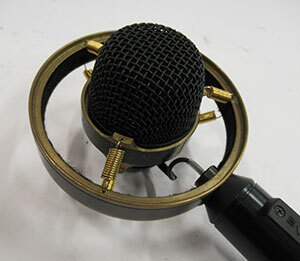 There is history in the walls of Richmond Film Services, and each microphone tells a story. There is an AKG C422 used by a certain VIP every Christmas to record a certain speech. There is the aforementioned Beyer M800 which was stolen the night before it was due to be used at the Royal Variety Performance, and in a suitably dramatic twist was recovered from the thief’s home with only hours to go. The latest 2017 reboot of The Mummy with Tom Cruise used an Audio -Technica AT4050 condenser microphone from Richmond Film Services. The ‘Wimbledon’ package of Sennheiser MKH series microphones are dispatched every year to recreate the visceral atmosphere of this globally renowned sporting event in front rooms across the country. The ‘Proms’ package heads out later in the summer to allow viewers to avoid the queues but still feel a part of the action from the comfort of their own armchairs. Like any industry the market has seen a change in both users and equipment preference; not surprisingly digital recording has mostly usurped analogue, and there are more individual camera owners that need to hire sound equipment to improve the audio recording standard (without necessarily the technical knowledge of what they really need). At the larger scale, the preference for shooting feature films and high budget television dramas with multiple cameras targeting wide shots and close-ups simultaneously has required a move from boom microphones to radio microphones. For all users, equipment hire has remained a highly affordable way to elevate the quality of sound for a relatively low cost. But in a modern world of efficiency and energy saving there is perhaps even more of a place for some classic equipment such as the early Nagra 2 recorders which were powered by clockwork! Nigel Woodford will be retiring from the industry this year and the new owner of the company has made the decision to sell the assets of the company. In September 2018, the equipment will be auctioned online by GoIndustry DoveBid, a Liquidity Services e-commerce marketplace. The auction will include the full range of pro-audio equipment including mono and stereo microphones, radio microphones, valve microphones, digital recorders, analogue mixers and amplifiers in addition to a huge variety of accessories across all items. There is also a large quantity of unused sales stock. We have worked together with Liquidity Services to identify the best way to sell the equipment including how to group the equipment, regional target markets for specific equipment, and whether certain items should be staggered as they would flood the market if released all at once. The auction will open on September 3rd and close on September 19th. Offers are also being taken pre-auction on packages of equipment. The auction can be viewed at gidb.auction/Richmond. Richmond Film Services supplied sound equipment used to record Her Majesty The Queen’s Christmas Message on several occasions and have been able to identify the specific AKG C422 condenser microphone that was used for the recording. This will be Lot 1 in the auction, and all proceeds from the sale of this item (including Liquidity Services fees) will be donated to The Film & Television Charity, of which Her Majesty The Queen is the Patron. One of Nigel’s first purchases was a Sennheiser MKH 805 microphone from an equipment auction at Shepperton Studios, so it seems only fitting that the company will now be holding their own auction from Shepperton Studios. Hopefully this will enable a new generation of recording engineers to embark on a similarly long career and in 45 years we will be able to look back at their achievements.